In this article, we’ll cover how to customize which Font Awesome icons are used in various places in the theme. Looking to implement more icons and styles? If you’re a Jump Start user and you’re looking to include Font Awesome Pro or a custom build of Font Awesome, check out our premium Font Awesome extension. But fear not, you can still customize every Font Awesome icon used in your theme. But instead of using CSS, you’ll be using PHP to filter the actual output of icons from your child theme’s functions.php. In every instance that the theme outputs a Font Awesome icon, the icon names are filtered in some way. So from your child theme’s functions.php, you can utilize these filters to affect which icons are outputted. Throughout the following code snippets, you’ll see generic Font Awesome icon names used like shopping-cart, for example. The theme framework has a way of taking these icon names, determining the icon style, and generating the proper CSS classes for Font Awesome. However, in every instance discussed below, if you’d like to specify the icon style used, you can pass the exact Font Awesome classes. For example, instead of shopping-cart, you could pass fal fa-shopping-cart to specify the shopping cart icon of the light icon style (if you’ve added light style icons to your website, that is). This will be really useful for Jump Start customers using the Font Awesome extension to implement additional icons and styles. One of the most common icon change requests is for the icon representing the shopping cart, when WooCommerce is enabled. Many people are looking to change this from the default shopping-basket icon to the more traditional shopping-cart icon. The theme framework has two separate instances of icons that link to the WooCommerce shopping cart, one of desktop and another for mobile. You can use the filter themeblvd_shopping_cart_icon_name to modify the icon used in both instances. This filter passes a string, representing the icon name. * @return string Icon name. When using WPML, the globe icon is used to link to the theme’s custom language switcher modal. Maybe instead of a globe, the language icon might be a good alternative. You can change this icon with the filter themeblvd_lang_popup_trigger_icon_name, which passes a string representing the current icon name. * language switcher modal with WPML. I honestly can’t think of a logical reason for changing the search icon, but the filter themeblvd_search_icon_name will allow you to do just that. Also note that if you wanted to only change the icon in the header that opens the search modal (i.e. what you see in the first screenshot above), you can use the filter themeblvd_search_trigger_icon_name instead. Over the years, Font Awesome has grown to include several different icons to represent the different social media services. So if you’re wanting to adjust which icons are used for the contact links you set up at Theme Options > General > Contact, you can use the filter themeblvd_contact_bar_icon_name, which passes a string representing the current icon name. In the following example, we’ll take several icons from our contact bar and change them to use the -square style instead of the default. So for example, twitter will be become twitter-square, and so on. * Change icons used with the contact bar. * @param  string $icon Current icon name. * @param  string $type Original icon identifier. * @return string $icon Maybe modified icon name. * to change, let's do that. * check for which icon you're changing. * results into the final $icon you're filtering. Font Awesome has several different icons for indicating direction and so it’s possible you may want to use different icons to indicate submenus in the main navigation. The theme framework uses angle-down and angle-right. But another logical choice might be to use the icons, caret-down and caret-right, for example. You can use the filter themeblvd_sub_indicator_icon_name to change the current icon name used for a given sub-indicator. It’s important to take into account the $direction parameter when using this filter. The direction will be down on the first level of the navigation and right on sub-levels. * indicate a dropdown menu. * @param string $icon      Icon name. * @param string $direction Direction indicator should point, `down` or `right`. * @param string $icon      Modified icon name. At Theme Options > Content > Single Posts, you can configure which networks display within the share links in the footer of single posts. To change the icons outputted with the links you’ve chosen, you can use the filter themeblvd_share_patterns. This filter passes an array of the sharing patterns used to create these links. Conceptually, using the filter to just change the icons is a little confusing, but just use the following code example as a template for changing the icon names you want. * @param  array $links Sharing patterns. * @return array $links Modified sharing patterns. We refer to the information that displays below post titles in your blog as the “meta information.” To change the icons used here, you can use the filter themeblvd_meta_icons. This filter passes an array containing all of the icons. You can use the following code example and adjust, as needed. * Change the icons used for the meta information. *     @type string $time      Icon name for the publish date. *     @type string $author    Icon name for the post author. *     @type string $comments  Icon name for comments number. *     @type string $category  Icon name for post category. *     @type string $portfolio Icon name for portfolio of a portfolio item post. * @return array $icons Modified meta icon names. When a post has a post format set, it will include an icon to represent that format in the meta information, which can’t be changed by the previous filter. These post format icons also show up in other places like search results. To change the icons globally associated with each post format, you can use the filter, themeblvd_format_icons. This filter passes an array of key, value pairs, where the keys are the post formats and the associated values are the icon names. * @param  array $icons Icon names. * @return array $icon  Maybe modified icon names. Another popular request is always to change the icons that appear when hovering over a featured image with a link applied. To do this, you can use the filter, themeblvd_thumbnail_link_icon_name. This filter passes a string that represents the icon for the current type of link; the possible types include image, video, post and external. * @param  string $icon Icon name. 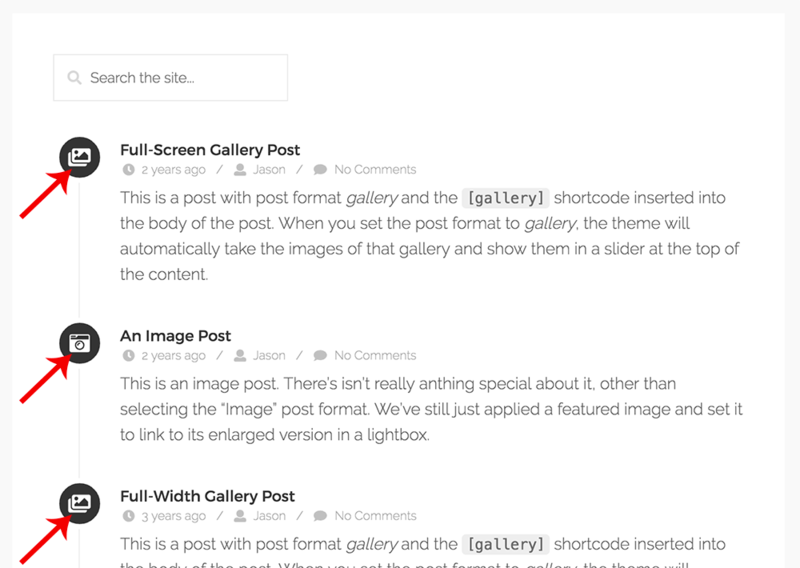 * @param  string $type Type of thumbnail link, `image`, `video`, `post` or `external`. // Setting: "It links to its enlarged lightbox version." // Setting: "It links to a custom lightbox image." // Setting: "It links to a lightbox video." // Setting: "It links to its post." // Setting: "It links to a webpage." By default, a toggle uses the icons, plus-circle and minus-circle. To change the icons used to open and close toggles, you can use the filter themeblvd_toggle_icons. The data passed through this filter is an array, which contains two icon names, one to open toggles and another to close them. * Adjust icons used for opening and closing toggles. * @param  array $icons Current icon names. * @return array $icons Modified icon names. // Icon for opening a closed toggle. // Icon for closing an open toggle. This one is a bit more obscure, but you’ll come across this icon when you’ve implemented a testimonial element and you didn’t add an image to represent the testimonial author. By default, the user icon is used. But let’s say we’ve got a bunch of testimonials from medical professionals and we want to use the user-md icon instead. 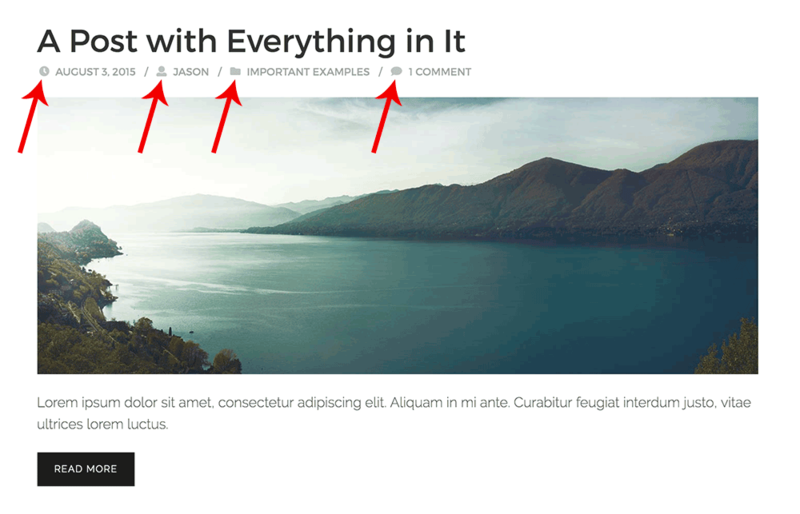 We can use the themeblvd_testimonial_author_fallback_icon_name filter which passes a string representing the icon name. * testimonial author, when no image is added. 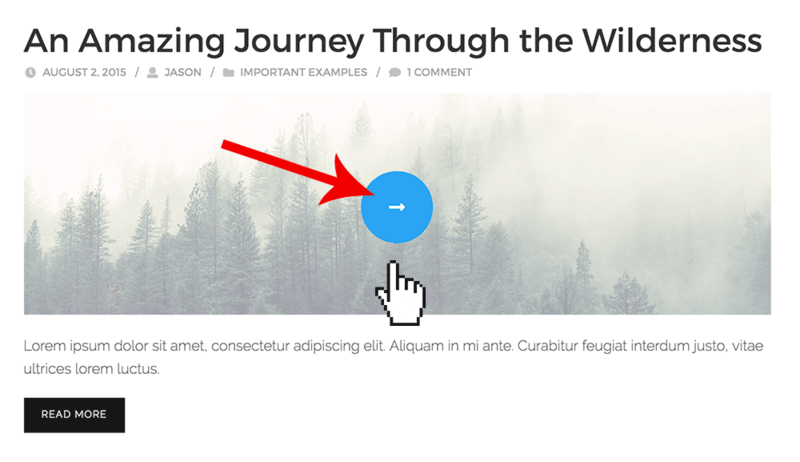 When applying the “link” post format, you’ll see this icon added to indicate that the title of the post is now an external link. By default the external-link-square-alt icon is used, but could be changed using the filter themeblvd_external_link_title_icon_name which passes a string representing the icon. * Changes the icon used in the title of "link"